2018 marks the start of a fresh season filled with fresh faces. All four home teams debuted their newly drafted rookies in front of a packed house at Shriner’s Auditorium in Wilmington, MA on January 20. With sights set on the Golden Fez, each team played amazing jams filled with thrills, spills, and athleticism. The Wicked Pissahs took the win over the Nutcrackers, final score 209-170. The Cosmonaughties came out triumphant over the Harbor Horrors, final score 286-226. 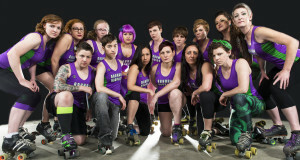 Harbor Horrors MVB: Trauma in the D. R.
Can’t wait for more roller derby action? Tickets are now on sale for games 3 & 4 on February 24. Weren’t able to make it to the Golden Fez Champs and you wish you could have been there for every hit? You’re in luck! 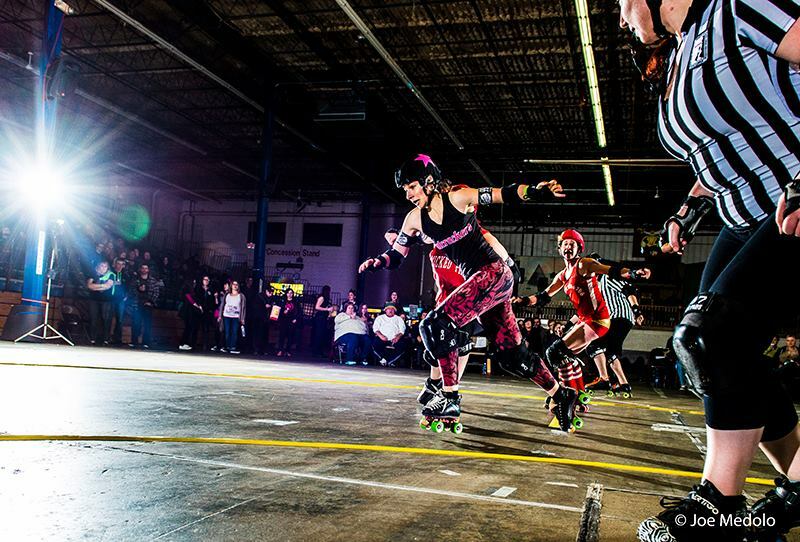 The New England Roller Derby Report (NERDerby) live streamed the games, and you can watch—and rewatch—those archives. 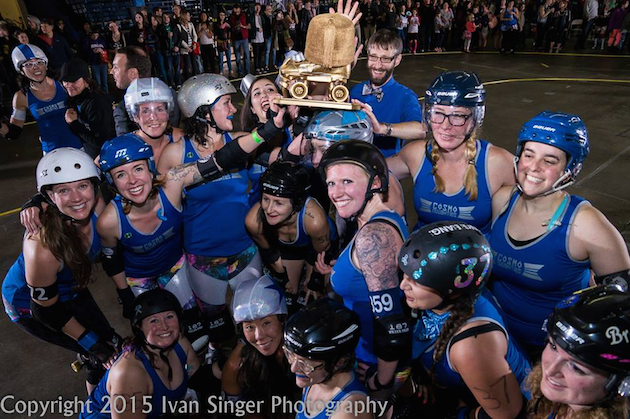 When you’re done, read our championship game recap for even more Boston Roller Derby coverage. 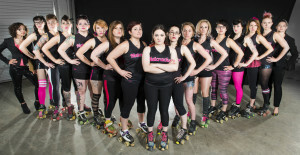 The Boston Massacre is the All-Star travel team from Boston Roller Derby. 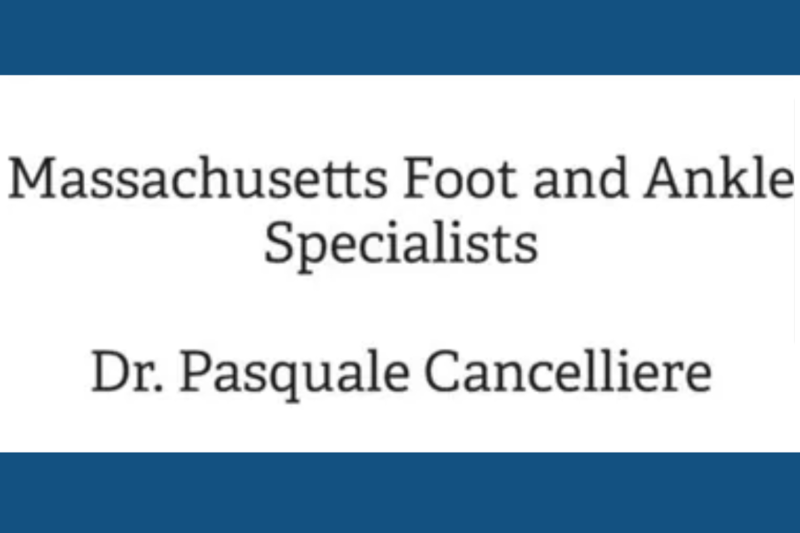 We are a group of 20 athletes from the Boston area who travel across the country and internationally to compete against other roller derby teams. 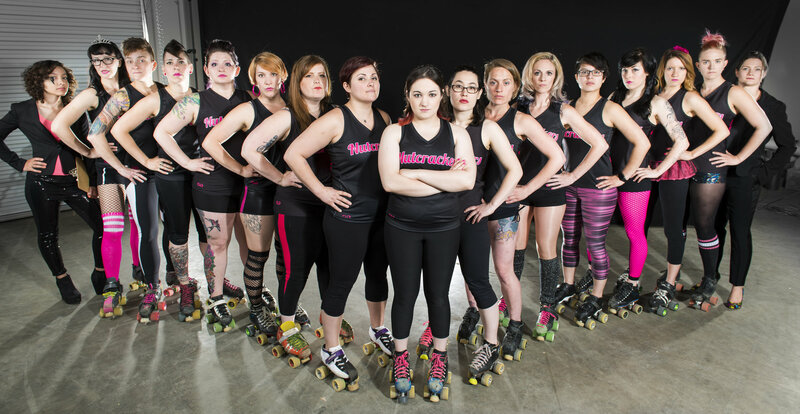 We are currently ranked 19 out of nearly 300 international member leagues of the Woman’s Flat Track Derby Association (WFTDA). While we are all extremely passionate about roller derby, it is an expensive hobby to bring to the public. The average travel team skater spends roughly $2,000-$4,000 per year on membership fees, equipment, transportation and lodging. That’s not even including medical expenses that inevitably arise from playing an intense, full-contact sport. To help lower the financial burden on our skaters, we are raising money for the 2016 season leading up to the Division 1 WFTDA Playoffs. All money raised will go toward airplane tickets, hotel rooms and transportation to games and tournaments. 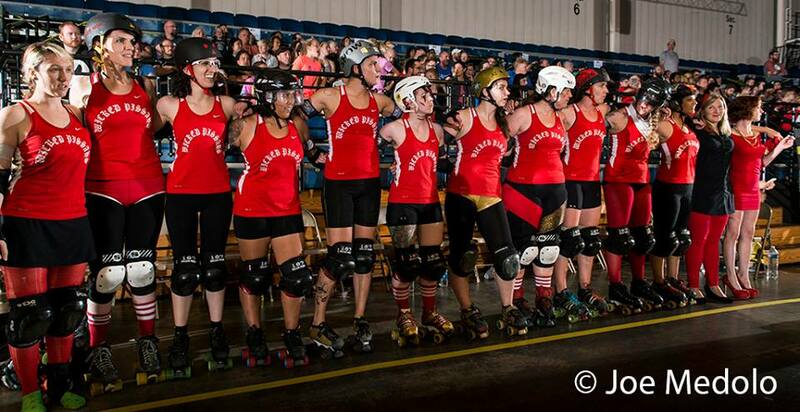 We dedicate so much of our time, effort and money into roller derby because, to us, it’s more than just a sport. It’s an opportunity for us to give back in small ways like this or this or this. It’s a place to build confident young girls and teens, and it’s an athletic community that welcomes diverse age, body type, racial, ethnic, and gender identities. Please help us reach our fundraising goal of $15,000 by donating today! From each and everyone of our skaters, we thank you so much for your support! 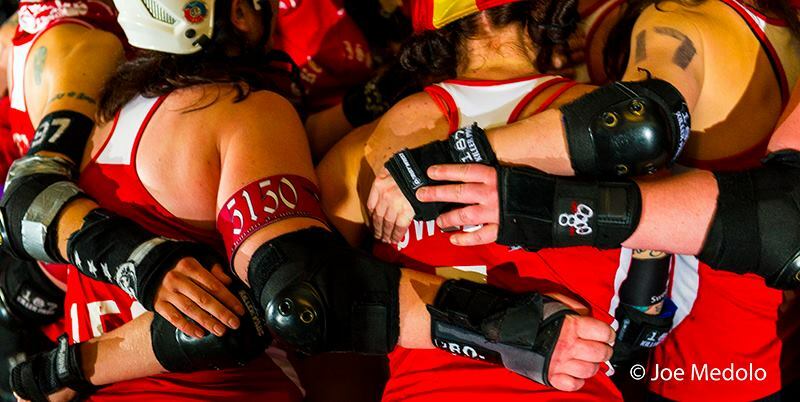 The 2015 season was a powerful and transformative one for Boston Roller Derby, and the coaches and captain of the teams could not be more proud of the success they’ve seen this past year. The all-star travel team, Boston Massacre, finished the season with a 10-5 record. They placed fifth at their playoff tournament in Omaha this fall, taking wins over Helsinki, No Coast and their first win in league history against Toronto. 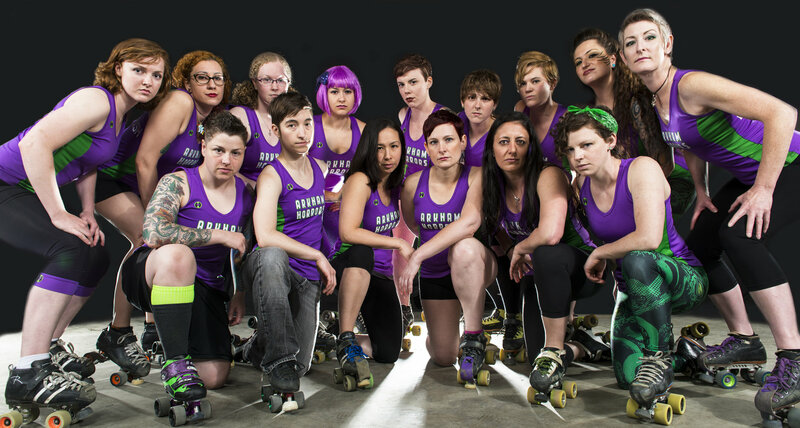 The strong showing there launched the team to 20th in the world on the WFTDA rankings. The 2014 season had ended with them at 25. BRD’s home teams also had an exciting year as the teams grew and elevated the competition throughout the season, which ultimately culminated in the Cosmonaughties taking home their first championship win in the team’s ten-year history. The Cosmonaughties celebrate their championship victory. Photo by Joe Medolo. That triumph was Cosmo co-captain Nora Morse’s proudest moment of the season, though she said she has a lot to be proud of her team for. The Cosmos took out the Wicked Pissahs in a close game for the Fez, but as Pissah co-captain Neurotic Tendency explained, the team still had plenty to be happy about this season. The Nutcrackers had a slow start to the season. Not only did the team draft the most skaters this spring, they also drafted the biggest crop of skaters who were brand new to derby. It was a season of growing and learning for the team, which paid off with time. After going 0-4 at the start of the year, the Nuts pulled out a victory for third place against the Horrors. This was a season of growth for BRD rookies, like Elektra Cute and Rachel Tensions of the Horrors, pictured above blocking Nutcracker jammer Peaches n’ Creamya . Photo by Joe Medolo. Though the Horrors, defending champions from the last two seasons, placed fourth this year, co-captain MC SlamHer is excited with what her team has accomplished. Everyone in BRD is training hard in the offseason to come back even bigger and better for 2016, including the participants in our training camp for new skaters. Be sure to check out our website for updates on our schedule and to get discounted tickets for our home games, or sign up for our newsletter. 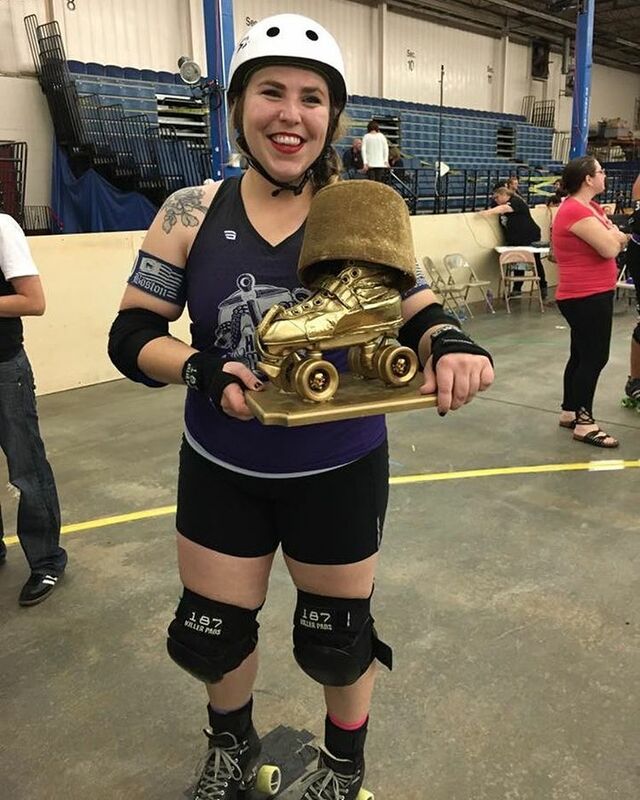 It was a commanding season for the Cosmonaughties this year, as the Boston Roller Derby home team finally clinched its long-awaited Golden Fez victory. The 2015 Cosmos pose with the Golden Fez after their championship win against the Pissahs. Photo by Joe Medolo. The team went undefeated all season to secure a win over the Wicked Pissahs in the final game of the year. After a decade in the league, it was the first championship win for the team, and a moment that co-captain Nora Morse said they have been working hard for. It was this collection of goals that helped the Cosmos stay together as a team and to develop the connections they needed to play together, she said. For them, playing well wasn’t about watching the score. It was about being in the moment and skating the way they knew how to. The Cosmos spent the season working on their walls and staying together, which made them a formidable presence on the track. Photo by Joe Medolo. Nora said that for her, the best part of leading the team is being able to ask her skaters questions and leading them to collective answers. Moments like that, she said, where she can see little improvements in how people are performing and recognizing when things come together for them are her favorite parts of the job. “BRD is such a big league with a lot to offer,” she said. The many ways that skaters can get together and grow as individuals and as teammates are what create victories like the Cosmos had this year. The Wicked Pissahs are thrilled with what they accomplished this year, finishing the 2015 home team season in second place, up from third in the two seasons before. What’s more, co-captain Neurotic Tendency said, was the attitude and enjoyment that was built into every aspect of the team dynamic. The 2015 Wicked Pissahs. Photo by Joe Medolo. 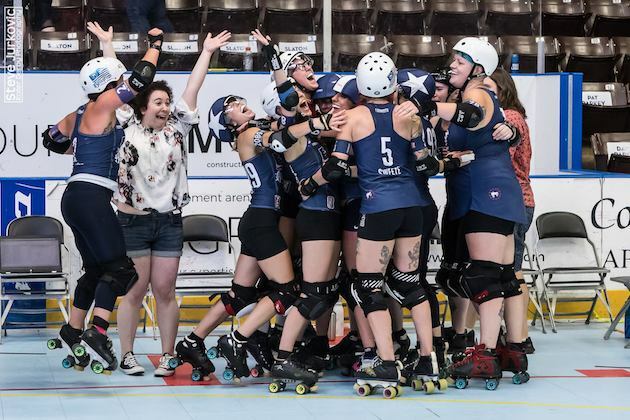 The team means a lot to the skaters who are on it, Neurotic explained, and said that for her as a captain and a coach, it’s that love and camaraderie that exemplifies what the roller derby community is all about. Neurotic also said that for her, watching her team grow and seeing the way the skaters evolved to work together or to see the advanced skaters helping the new ones reach their personal goals is especially powerful to her. “We had a really good vibe at the end of the season, our experienced skaters were working really hard with our less experienced skaters so the whole team could grow together,” she said, adding that she doesn’t want to take credit for anyone’s growth. “That is a lot of their own hard work,” she said, emphasizing that while experienced skaters and a supportive environment gave new skaters the tools to grow, it was their own efforts that made it happen. For Neurotic, one of the most prominent moments for that came during the playoff game against the Horrors, who had beaten the Pissahs earlier in the season. The Pissahs watch the final jams of their playoff bout together, a moment that co-captain Neurotic Tendency said showed the solidarity that makes her love her team. Photo by Joe Medolo. Neurotic will captain the team again next season, alongside mid-season draft Aubrey Planitz who came in and took on a guiding role for the newer skaters in 2015. Neurotic said that their goals for next year will be much of the same as she worked on with co-captain Evabyn Slapt this past season. With six new draftees at the start of the 2015, four of whom were rookies, the Nutcrackers knew it would be a season of development and nurturing the potential of new skaters. The 2015 Nutcrackers. Photo by Joe Medolo. It may have seemed like a slow start to the year for the Nuts after going 0-3 during the regular season, but behind the scenes they knew that they were getting stronger and learning how to play together as a team. Each practice was an opportunity for growth for their new skaters, and the time the team spent together on the track helped them to evolve into a cohesive unit. “We’ve been working our little nutty tails off,” Slicer said. It was hard work that finally paid off in the last game of the season. The Nuts faced off against the Horrors in the third place game during the championship, and for much of the first half the score was very back-and-forth between the two teams. By the end of the game, however, the Nuts had secured a strong lead and took home a long-awaited victory. The Nutcrackers celebrate their first win of the season. Photo by Joe Medolo. The season wasn’t just about the bouts, however. The Nuts like to work hard and play hard, and off the track support and togetherness was just as much a part of their growth as their drills and practices were. “Our time together, both on and off the track, was full of laughter and smiles,” Slicer said. The team’s motto for the season “#igotyourback” was all the motivation they needed to learn to work together and develop into a force to be reckoned with on the track. In a close season of challenging victories and hard fought losses, the Horrors have a lot of accomplishments to be proud of. That effort often paid off this year, with strong wins against the Wicked Pissahs and the Nutcrackers earlier in the season. Even games lost had moments of greatness for the Horrors, who value the importance of their growth and teamwork above any of their scores. 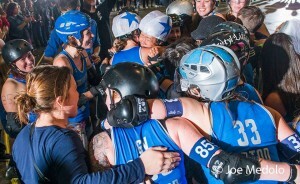 SlamHer, who is also the head of coaching for Boston Roller Derby, said that for her, the best part of the season revolves around the moments when the team is together celebrating its skaters, citing the end-of-season party where they all gather to celebrate their individual and collective goals of the season. She said that for the Horrors, the team’s biggest goals were to just work hard, improve a lot and to have fun. She is confident that her team achieved all of those goals this year. “We wanted to see a lot of growth from our new players, and we totally did,” she explained. Horrors co-captain MC SlamHer lines up against Womanimal during their final game of the season. Photo by Joe Medolo. That goal isn’t going to change for next season. The team is constantly striving to be the best skaters that they can be, and when they find ways to improve, that’s a victory their coach is proud of. What will be changing for the team next year is the name. Originally named the Arkham Horrors, the team once played with a theme of early 20th century horror in the vein of H.P. Lovecraft. Lovecraft is a famed writer in the horror and sci-fi genre who drew inspiration from Massachusetts locations, but the team discovered after choosing this name that the author had racial worldviews that are directly in contrast with the values of the Horrors and of BRD. The team has moved to strike any reference to the writer from their team, and will be rebranding as a new kind of Horror for 2016. After a hard fought home team season, the Cosmonaughties emerged victorious to take home their first Fez Cup win, defeating the Wicked Pissahs. Third place went to the Nutcrackers in their first win of the season. Defending champions the Horrors took fourth. The Wicked Pissahs and the Nutcrackers kicked off their last bout of the home team season on December 14th at Shriner’s Auditorium in Wilmington. The Pissahs took an early lead, with jammers like Stevie Nixher, Chicana, Sweet Enemy, Truant, and Rock scoring points off of the Nuts. 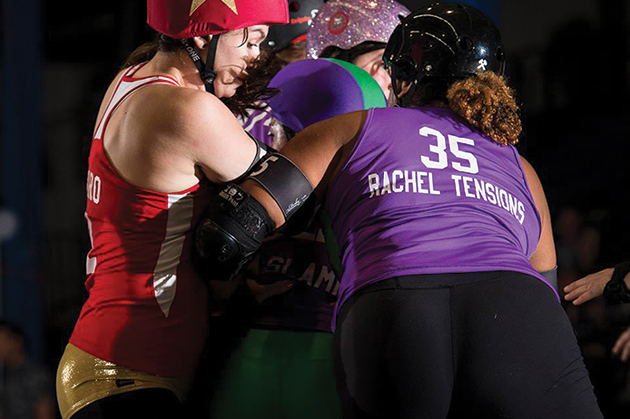 The Pissahs’ blocking looked extra-sharp, and their jammers took full advantage of it. The Pissahs’ new recruit Sweet Enemy got through thanks to a gorgeous 3-wall helmed by Maully O’Fender. 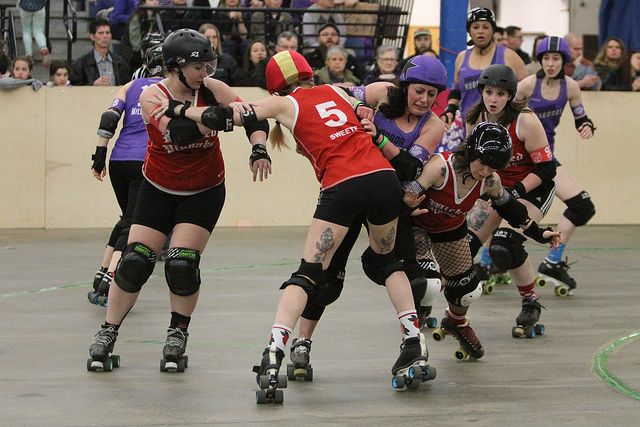 The Nutcrackers went hard against the Pissahs’ walls – Senora Slaughter rocketed across the track, bouncing off of blockers, and Wammy and Hard Times did excellent jobs of getting through the pack quickly on their initial passes. The Nuts had a few streaks of getting lead jammer, but the Pissah defense was tough to beat. The jams came short and rough in the beginning and got longer as the game progressed, with both teams getting power jams. 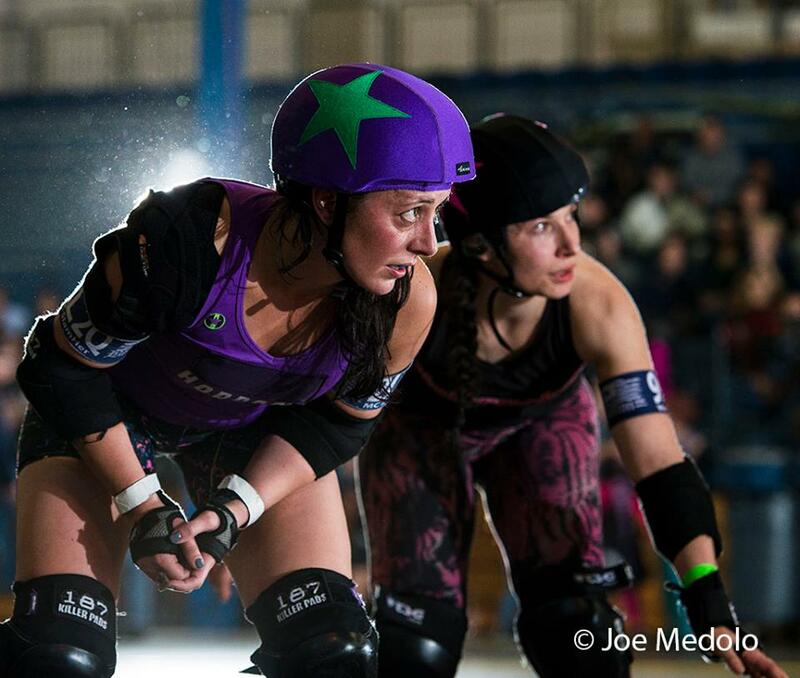 Dottie Danger performed some outstanding offense and helped get her jammer through on multiple occasions. She swung in seemingly out of nowhere and knocked blockers out of position. Still, the Pissahs held on to their lead, and the score reached 87-45 by halftime: not a high-scoring game, due to strong walls in the pack. The dynamic packs showed how much both teams have been practicing: the bridging was tight and smartly done. The Nuts inched closer to the Pissahs’ score in the second half. Stevie Nixher made an apex jump to leave the Nuts’ blockers in the dust, but then Badonkey Kong swept in and knocked her about a mile out of bounds! Womanimal heard the call and when she hit the track next, she repeatedly lapped the Pissah jammer. Then, when Hard Times got yet another power jam, the Nuts were looking like they could come from behind and win it! 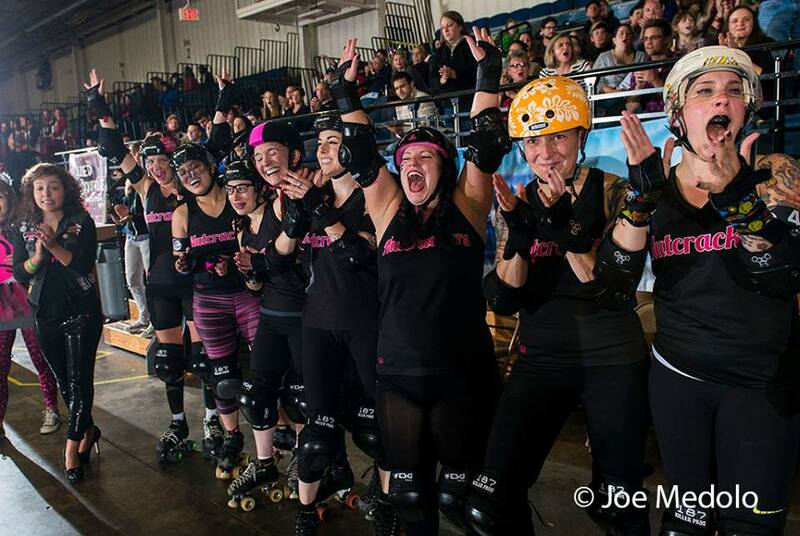 The score came to 170-159, the Pissahs up by eleven points, and in the final jam Dottie Danger called it off to thunderous cheers from the crowd. The Wicked Pissahs won but both teams went home proud. 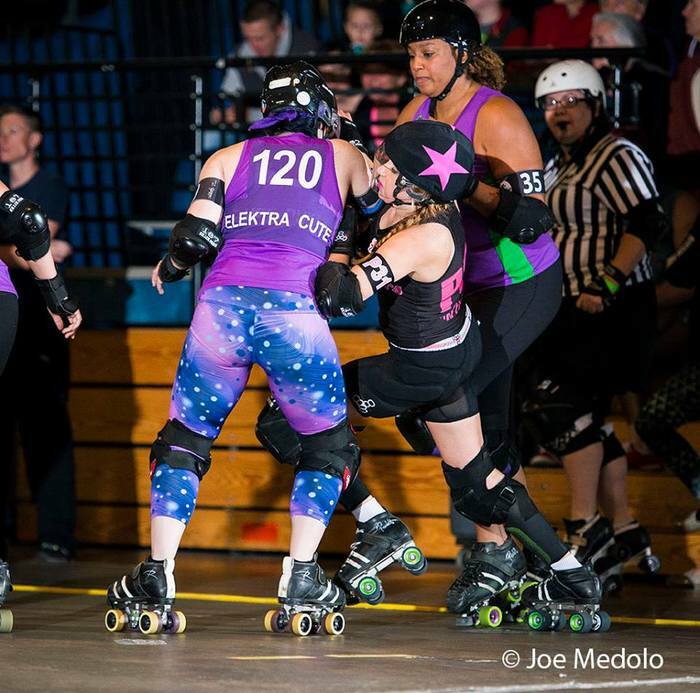 In the night’s opening jam, the Nutcrackers put Senora Slaughter on the line up against the Cosmonaughties’ Elle Elle Cool Jam. The Cosmos got on the scoreboard first as Elle got lead jammer and Elle took full advantage of it, weaving in and out in a power jam! 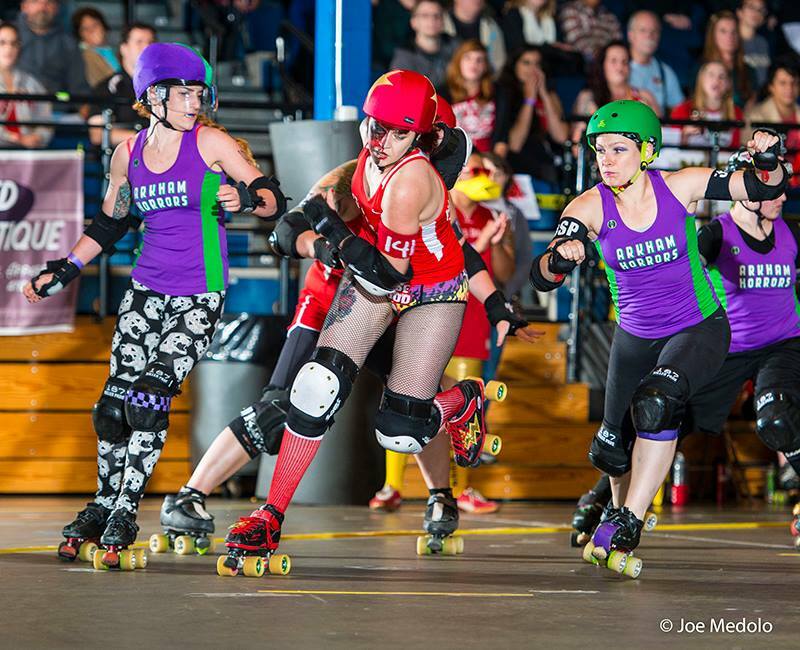 The Nutcrackers challenged the Cosmonaughties in October’s Home Team bout. The Cosmos took an early lead as their jammer Elle Elle Cool Jam put up points, getting a power jam at the very first opportunity! Next up, Dottie Danger rocketed through the pack thanks to an effective screen by her teammate Smackerena, putting the Nuts on the board and bringing the score to 28-2 in favor of the Cosmonaughties. Belle Air Bomber, returning to the track for the Nuts, scored two points along the inside line, and then her teammate Senora Slaughter had a neat ten point jam thanks to her blockers EmNasty, Mandoline Slicer, and Peaches ‘n CreamYa who had Cosmo jammer Celia Casket trapped in a Nutcracker Swirl. She-Bear retaliated for the Cosmos, slamming through the Nuts wall and somehow magically untying Dottie Danger’s skate! 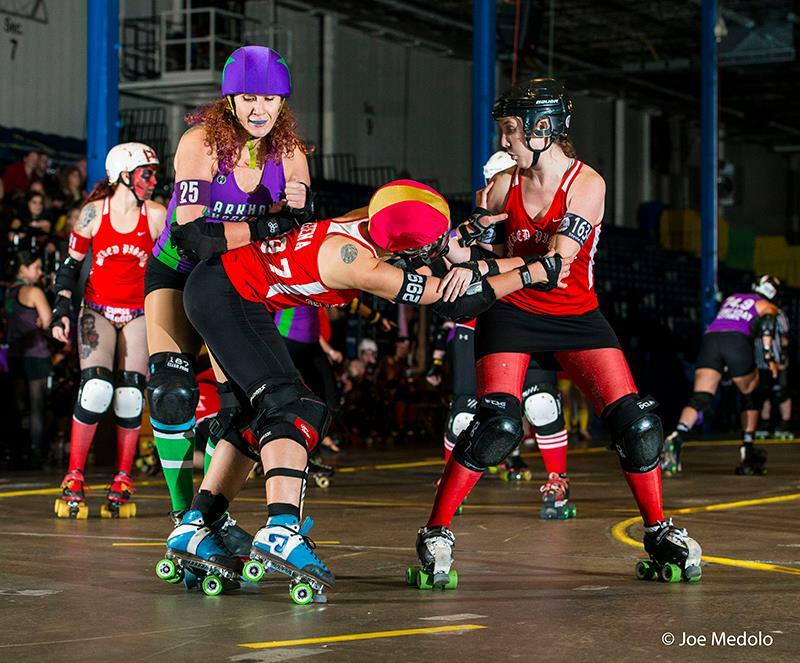 Dottie paused to tie her laces, passing the star to Nuts team Captain, Planitz Collide. She-B scored ten, then Elle scored four, and the Cosmos appeared to be taking control of the game. However the Nuts pulled answered back in the next jam, and Slaughter toe-stopped her way to ten points for the Nuts, and then Mandoline Slicer scored a few more too! Nutcrackers closing the gap, 42-27. There was a diverse group of jammers playing tonight – both teams seemed to be trying out their entire roster. 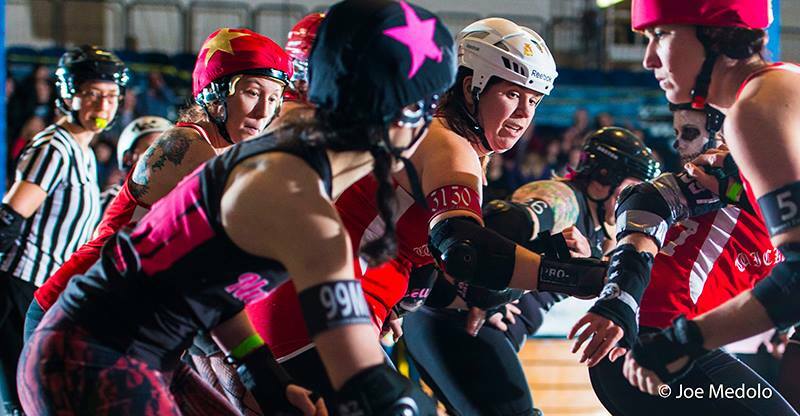 The back-and-forth of getting lead jammer continued, but the Cosmos asserted themselves on the track with powerful, agile jamming and their lead lengthened to 40-50 points where it stayed for much of the bout. The Nuts showed incredible stamina and ability to let hits roll right off of them, but ultimately weren’t able to fight off the Cosmo jammers who just ripped through the packs. The Cosmos won 248-148, remaining undefeated this home team season. They definitely have their eyes on the Fez Cup this year. The Wicked Pissahs played against last year’s Fez Cup winners, the Arkham Horrors. The Pissahs’ defense helmed by Amy Rock, Estrogeena Davis, and Neurotic Tendency dealt with the Horrors while Truant scored the first lead jammer status of the bout. Truant power jammed, scoring 26 points to give the Pissahs a hefty starting lead! 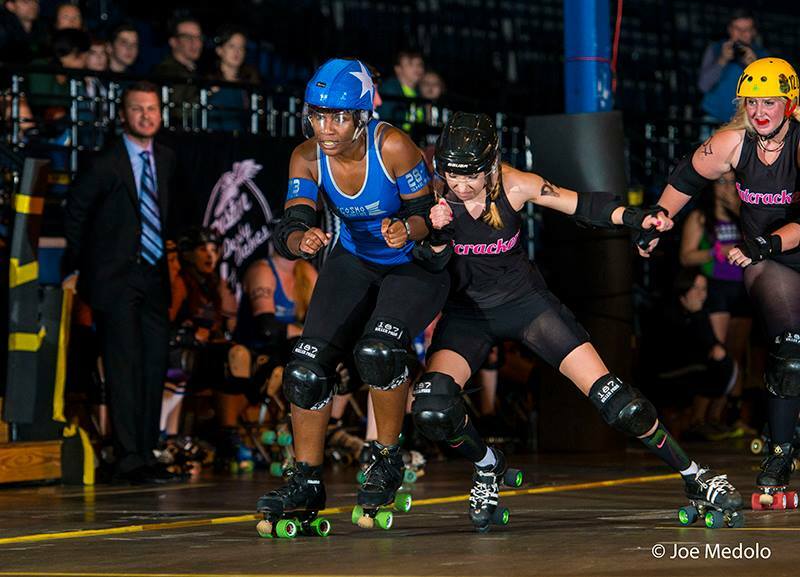 Stevie Nixher and Flyin’ King were on the jammer line next, for the Pissahs and Horrors respectively – these two are teammates on Boston Massacre, do they know all each other’s moves? King had a hard time getting out of the pack as the Pissah wall kept recycling on itself, and Nixher scored four points. Lisa Lionheart landed some huge hits to clear the way for Gun Show, who got another power jam for the Pissahs. Horrors blockers Trauma, Hayley Contagious, and America Ferocious got Guns next time though, bear-hugging her into submission while KC Wastem got out ahead. Mean hits by Hayley kept the Pissahs in line for a jam or two, the score was 51-4, Pissahs. Nixher struggled to pass Wednesday Atoms and America Ferocious, so she passed the star to Rock. Jam after jam passed with no scoring, leaving the crowd to wonder who would break the streak. The Pissahs did, putting up small points on the board, but then King came in and got a big jam, bringing the score to 62-33 with the Pissahs in the lead. We saw a couple huge jams in a row and both teams showed off their mental endurance, keeping gameplay tight. Rock broke apart a Horror pack but inadvertently let Rainbow Crash slide through behind her. 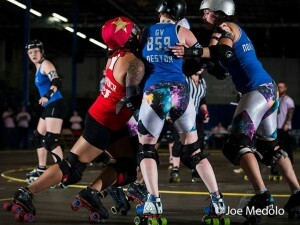 KC Wastem got lead jammer again as a huge hit by Fuzzta Rhymes knocked the Pissahs out of commission for a few seconds. 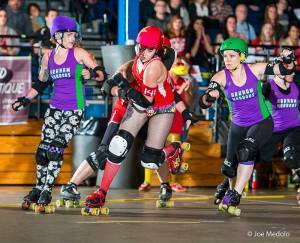 MC Slamher, co-captain of the Horrors, got lead jammer next and tightened the race further to 74-55, Pissahs. Rainbow Crash came up and scored eight points for the Horrors by landing a big hit and sliding through when the Pissahs’ wall got a bit wobbly. 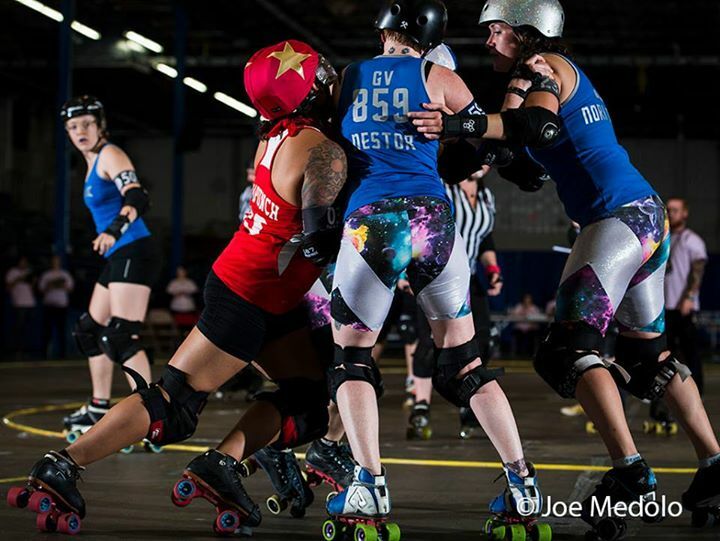 The Horrors continued to inch closer to the Pissahs’ score, Captain Hook dealing with blockers like Geena to let the Horror jammer through – the Pissah lead was only 6 points!! However, Rock stepped up and padded the lead, making two scoring passes to every one done by the Horrors. The Pissahs made some effective plays, like when Geena caught Rainbow Crash in a series of painful-looking runbacks. Rock continued to scatter the Horrors’ ranks and Stevie Nixher seemed to leap right over them. The Pissahs’ lead got bigger and bigger as they kept getting lead jammer, and the score was 170-146 by the end of the 44th jam. The Horrors put in Rainbow Crash with only 3 ½ minutes left in the bout, and the crowd was on edge wondering whether the Horrors would bring it back. Truant was held back by a very determined pack of blockers while Crash made pass after pass – Truant passed the star to Geena – Crash wasn’t stopping, she plowed through with the help of her blockers, suddenly the game was tied! It was 170-170 with two minutes left! Crash scored one more point and for the first time in the game they were winning, IN THE LAST JAM! Crash got sent to the box and Nixher started on the line for the Pissahs, who did it: they ended it. The Pissahs won 182-175! !